There is a lot more you can make from potatoes but delicious chips or French Fries. Potatoes can also be used as a stamp, and then create funny stamp pictures. From each potato, you can make to stamps when you cut them in half. Next, using your watercolours paint the desired motif on the cut side of your potato. If you want to use the stamp several times, make sure to put more colour on it, every so often. 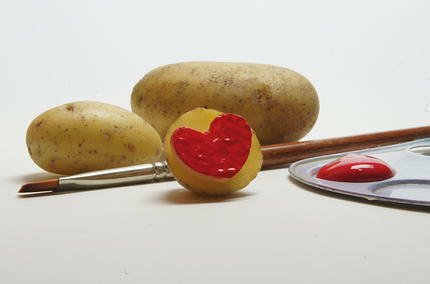 If you wish to make a stamp picture, you can quickly change the motif by cutting off a thin slice off your potato. Paint on the next shape and keep on stamping. Repeat this procedure for every new motif.